I recounted in my last post the many adventures we had driving 1,750 miles from Illinois to Arizona where we damaged not one, but two rental cars. We saved $100 by not purchasing the rental car company’s auto insurance, but that decision cost us $500 in our deductible. Not my brightest move ever. The rental car company we used said any damage smaller than the size of a quarter, they would let slide. Anything bigger than that, and it needed to be repaired. Any time you drive a car, you risk bumps and scratches to the car’s exterior. I have a large scratch on the back of my vehicle that I find annoying, but not worth the price of paying my $500 deductible. I’m guessing your own vehicle has similar scratches and dents. They’re minor, and you don’t want to spend the money to repair them. The choice is yours because it’s your vehicle. However, if it’s bigger than a quarter, the rental car company is going to make the repair, and you will pay if you don’t take out the rental car company’s insurance. Another reason people let minor dents and scratches on their own vehicles slide is because they don’t want to face a claim and risk having their insurance go up. Some people even do this for more major repairs. 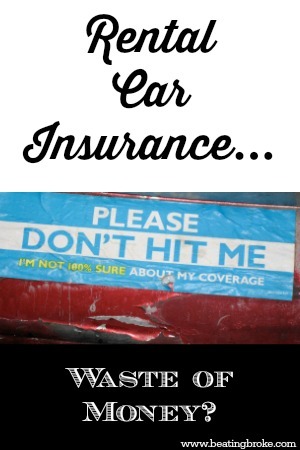 Several years ago, a man rear-ended me, and he chose to pay the $1,400 for the repair to me directly so he could avoid submitting the claim to his insurance and risk having his premium go up. If you don’t purchase the rental car company’s auto insurance, you’ll have to choose to pay out of pocket or to risk having your premium go up. 1. Have you made any claims on your insurance in the last three to five years? 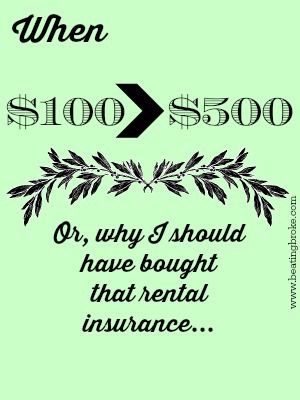 If so, you will probably want to purchase the rental insurance; in the long run, that will be cheaper than facing a spike in your insurance. 3. How high is your deductible? If your deductible is anywhere from $500 to $1,000, purchasing rental insurance may be smarter, especially if it is going to be less than $100. What is your opinion? 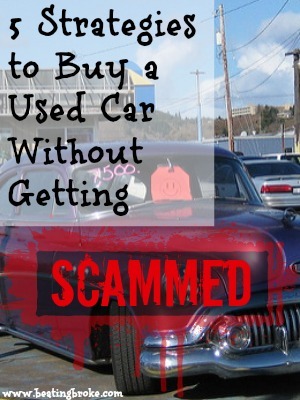 Purchase car rental auto insurance or just rely on your own car insurance? My husband was offered a job in Arizona, 1,750 miles from where we current live in Chicago, Illinois. Because neither of us had been to Arizona before, we wanted to visit before we committed to living there. Time was of the essence, and booking a last minute flight for the two of us was expensive, so we decided to drive. We also decided to rent a car for the trip to save wear and tear on our car and pay less in gas (our family car is a minivan, so a small sedan would use much less gas). Being frugal, I decided not to buy the rental car company’s insurance. I had called my auto insurance company, and they assured me that my coverage would cover any damage to a rental car. By not buying the rental company’s car insurance, I saved $100, or so I thought. I was proud of my penny pinching ways until our first night on the road. We were driving along a desolate stretch in Oklahoma; it was dark, and we were ready to stop for the night. A semi was in front of us and swerved at the last minute. We had no time to wonder why; a deer carcass was straight in our path. Even though my husband swerved, he still hit it. We felt the thump under our car and feared the worst. When we got to the hotel, we didn’t see any damage to the bumper, so we thought we had lucked out. That thought soon faded when we were driving through Texas the next day and heard something clicking against the tire. A piece of the interior bumper was hanging down and hitting the tire. We pushed it back in and thought all was well until we hit the brakes in Santa Fe and felt resistance on the tire. Yep, the piece had fallen down again. Long story short, in Arizona, we traded out the vehicle for a different one and had to pay a $500 deposit for the repair. As we passed the street sweeper, what seemed like a million pebbles pelted our windshield. I think my husband and I cursed in unison when we heard a particularly nasty hit on the windshield and saw a chip in the windshield, right in the middle of the driver’s side. Car rental number two, and another injury to the car. Sigh. Suddenly my decision to try to save $100 by not getting the rental company’s car insurance didn’t seem like such a good idea. Still, my desire to save $100, ended up costing me $500! Stay tuned for part two, where I’ll explain in more detail why rental car companies’ insurance isn’t the waste of money we all think.